Sumac Lemon Baked Chicken Wings are baked to perfection - creating crispy, juicy chicken wings. These wings are tart, sweet and lemony. The perfect mix of flavors to pair with creamy hummus or yogurt dipping sauce and a fresh salad. In a large Ziplock bag combine the olive oil, salt, ground black pepper, lemon juice, minced garlic and sumac. Add the Just BARE Chicken Wingettes and Drummettes to the bag, close the bag and use your hands to massage the marinade into the chicken. Refrigerate overnight for at least for 2 hours. When ready to bake your chicken wings preheat the oven to 375°F . Remove the chicken from the refrigerator. Using tongs place the chicken wings in a single layer on a baking sheet along with 1/2 of the sliced lemons. Sprinkle the remaining 1 Tablespoon of sumac over the chicken wings. Bake for 45-50 minutes, or until the internal temperature registers at least 165°F. Optional step: If you want your chicken wings extra crispy move the chicken wings to the top rack and broil for 2-3 minutes, or until the skin turns golden brown and begins to crisp. Garnish with chopped fresh parsley and green onion and the remaining lemon slices. 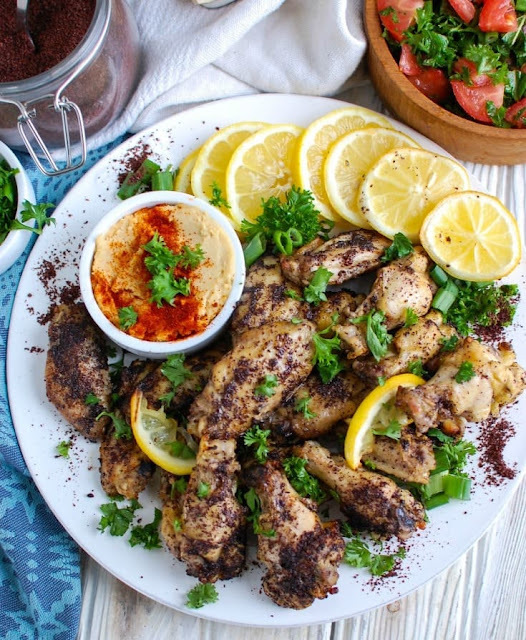 Serve the chicken wings with creamy hummus or a yogurt dipping sauce along with a fresh salad, like tabbouleh. I love my food sweet and a tart so I used the juice of two lemons. If you want less lemon flavor try using just the juice of 1 lemon. To make a yogurt dipping sauce use plain yogurt, your favorite spice like cumin or za'atar, minced garlic and lemon juice. Mix well and serve with the chicken wings. You could also sprinkle feta cheese on the wings or even sprinkle the tabbouleh salad over the wings for added flavor. These make a great game day food, meal for dinner or a finger food for a party! If you watch your salt intake you can take the salt down to 1/2 teaspoon.